Since my last post on this award, things have evolved. I agree that the Prix Pictet is now one of the leading prizes in photography. Prize money, recognition, publicity for the laureates and short listed photographers are quite epic. Awareness for sustainability is well raised. 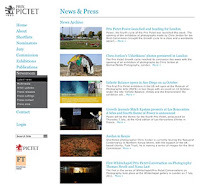 "Launched in 2008 by the Geneva-based private bank Pictet & Cie, the Prix Pictet has rapidly established itself as the world’s leading prize in photography and sustainability. It has a unique mandate – to use the power of photography to communicate vital messages to a global audience. The goal is to uncover art of the highest order, applied to confront the pressing social and environmental challenges of the new millennium. The Prix Pictet has two elements: the prize of CHF 100,000 awarded to the photographer who, in the opinion of the independent jury, has produced a series of work that speaks most powerfully to the theme of the award; and the Commission, awarded by the Partners of Pictet & Cie, in which a shortlisted photographer is invited to undertake a field trip to a region where the Bank is supporting a sustainability project. American photographer Chris Jordan was invited to undertake the third Price Pictet Commission. The fourth theme of the Prix will be Power. Between now and January 2012 a network of 180 experts from five continents, acting as nominators for the prize, will scan the globe in search of images that are both of the highest artistic merit and have the narrative power to provoke and disturb, but also to inspire". The Shortlist will be announced at the festival Les Rencontres d’Arles in July 2012.